Introducing the new ChatterBait Elite model, which is built with the patented, bladed swim jig design. 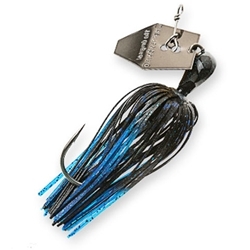 It supports a 5/0 Gamakatsu hook, new EZ Skirt jig skirt with a low profile hub, and custom head paint schemes and blade finishes for precise skirt matching. The Elite sereies also offers a molded-in trailer keeper that prevents soft plastics from sliding and a strengthened head-to-blade connection.